Pineapple Rice SaladI have a few recipes already bookmarked, as you can see, one of which I decided to make for breakfast Sunday morning. 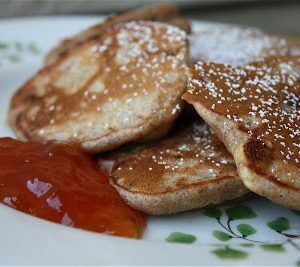 Something about banana fritters sounded so good to me, especially the part about dipping them in fruit preserves. The batter came together easily, and they cooked up quickly…a lot like pancakes. My husband and kids literally gobbled them up. I highly recommend that you use pastry flour for a recipe like this. Here’s a tip if you can’t find any (like I sometimes can’t)…process your regular whole wheat flour in a food processor. It will give it a finer texture and will keep your recipe from becoming too dense. I chose to use light vanilla soymilk in the recipe, as well as adding a few tablespoons of ground flaxmeal to the batter for some extra nutrition. My husband and I dipped ours in peach preserves while the kids at theirs dipped in maple syrup. So before I get to the recipe…let me tell you a little more about the giveaway. All you have to do is leave a comment here on my blog for a chance to win your own copy of The Vegetarian Family Cookbook. 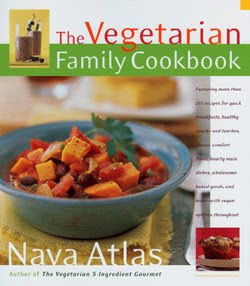 Nava will personally send an inscribed copy of her cookbook to the giveaway winner. Here’s a little bonus…my sister in law Jamie of Mom’s Cooking Club is also giving away this cookbook. Go over to her blog and increase your odds of winning by entering her giveaway too! Giveaway starts today and will end at midnight Tuesday. Winner will be announced Wednesday. Leave an additional comment here telling me you did one of the things listed above and that additional comment will count as your additional entry. Sound good? Combine all the ingredients except the maple syrup in a mixing bowl and stir until just smoothly blended. Add a bit more milk if the mixture is too thick. Heat a nonstick griddle and coat lightly with some of the margarine (I used cooking spray). Drop the batter on the griddle in 1/4 cupfuls. Cook each fritter over medium heat on both sides until golden brown. Serve hot, either on its own or with maple syrup or all fruit preserves. Next Post » Under Construction! ah! What a great giveaway. The fritters look amazing. You know I'm always on the lookout for new/great veggie friendly recipes. These fritters sound absolutely jummy and they look amazing. What a nice giveaway!! I just tweeted the giveaway as well! The banana fritters sound delicious! Not something I think of when I think vegetarian. How have you been Aggie? It's been a while eh? The fritters look fantastic and what a nice give away to boot! I probably have a book about almost every cuisine, but no vegetarian! The fritters look delicious. I am like all the others, I have started trying to incorporate more veg meals in my life. Who knew so many delicious recipes were out there. What a great giveaway. Of course, you already know that I would love the vegetarian cookbook! I will tweet right after I comment here and I already did post on my FB page – the link for you and Jamie! Ok, I just posted a comment on the other blog. These look so yum too!! These look so good and great giveaway! Found you through GrumpysHoneyBunch! Nice blog. 🙂 Sign me up for the giveaway, I can always use another good cookbook. Be Well! I have some ripe bananas sitting on my counter right now! I'd love to be part of the giveaway. Lovin' the bananas and the whole wheat! And the giveaway! I used to be a vegetarian, and I am always looking of great ways to incorporate meatless dishes into my weekly meal plan! These look great! I'm wondering what makes these different than pancakes? Is it the type of flour you use? I love the idea of a family-friendly vegetarian cookbook. I would like to incorporate more vegetarian meals in our menu, but some of them seem either too complicated, include hard to find ingredients, or just don't sound good. Wow this recipe sounds so good! I've been recently looking into more vegetarian recipes and this one came at the right time! Nava's website is great also. Hey there! Thanks for the giveaway! The fritters are super cute! I would love more quick meals that are veggie based! So excited! I also went to your sister in law's blog and posted on her comments page as well! I hope I win! I think I will give these fritters a try. My pancakes are always a disaster, perhaps these will be better. I will retweet about the contest. The fritters look wonderful. I hope that very nice giveaway goes well. Have a great day. great giveaway, the banana fritters look like such a treat! I'm new to blogging and came across your giveaway. How nice of you to share with your readers. Any chance to win something involving cooking is worth a post. Just posted to Mom's Cooking Club and because I like to share cookbooks with my friends I Facebooked it too. Couldn't pass up the opportunity for another Veggie cookbook! And the banana fritters DO look AMAZING! The banana fritters look delicious! and I always love a giveaway, especially when exceptional cookbooks are involved! Great giveaway! I'd love to find some vegetarian fare I can pass off on my picky husband! giveaway and banana fritters? how can i not comment… (: i'm not entirely vegetarian, but i only cook that way at home for my man and kiddos… this book looks lovely. Even though I can’t win this cookbook since I’m also doing the giveaway, I wanted to be the first one to leave a comment on your new blog site. I love it and have appreciated the sneak peeks along the way. It looks fantastic and I wish you all the luck with it. The fritters and the cookbook look great! Yummy! the fritters look delish! I am not a vegetarian, but I eat very little meat, and this would be great for concocting some new recipes. Thanks for the opportunity to win. I've made lots of recipes using bananas but never banana fritters! New one to me….I would love to try that sometime. Sounds awesome!! I would love that cookbook. Looks great! I am always on the lookout for more vegetarian recipes, so I'd love to win a cookbook copy! I've been looking for a good vegetarian cookbook-this would be great! The fritters look good! Those banana fritters look awesome. Thank you for this giveaway opportunity! Hello again Aggie – I just posted a comment on your sister-in-laws site. Yum! Looks delicious 🙂 We are big on veggie foods in this household, so this book would be great for us! These sound amazing Aggie from a cookbook after my own heart. Sorry for the REALLY late reply Megan! Missed this! I have never freezed these, but don’t see why you couldn’t, I freeze pancakes all the time for my kids. I like to lay them flat in an big ziploc bag initially so they freeze flat to make storing easier. THESE look absolutely delicious and I cannot wait to try them! I am a runner, and these sound like the perfect pre or post run snack/breakfast! I also love that you use pastry flour- I have a bag of whole wheat pastry flour that I was just thinking I needed to use up soon! Thanks for passing this along! these really do make the best snacks! I need to make them again soon, especially for summer time snacking (because my kids seem to be hungry all day long!) Thanks for stopping by and for the kind words. These look absolutely delicious! Thanks for posting this. I’ve been trying to get some new ideas for my family. We’re trying to eat more locally. I stumbled on this site by accident, but so glad I did! no egg? Doesn’t pancake batter need egg? This will be even more yumtious if it doesn’t!